Lama Zopa Rinpoche arriving at Chokyi Gyaltsen Center, with resident teachers Geshe Deyang and Ven. Roger Kunsang, Penang, Malaysia, March 2016. Photo by Bill Kane. 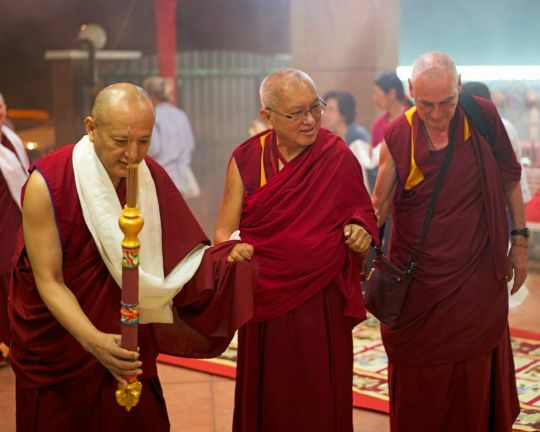 Lama Zopa Rinpoche gave this teaching to about 50 ordained Sangha during a visit to a giant shopping mall in Kuala Lumpur, Malaysia, in April 2016. Rinpoche was in Kuala Lumpur giving teachings organized by Losang Dragpa Centre. The “I” is merely labeled by mind but it only appears like that to a buddha because buddhas don’t have even the subtle negative imprints – the obscurations to knowledge (Tib: she-drip) – left by the ignorance holding the “I” as truly existent. Having totally purified these, these have ceased [in a buddha’s mindstream]. There is no dualistic view, no hallucination, no projection when the “I” and all phenomena appear as truly existing from their own side, as real. A buddha does not have this hallucination at all. You have to understand that. What appears to a buddha is what is merely labeled by the mind. So, you see how all the other schools’ views of what gag-cha is – how the “I” appears to us – are to be totally abandoned as they are all the wrong view. When you walk, there’s one meditation you can do. Everything, even subtle things, should appear merely labeled by mind – the “I,” action, object, everything. But, that doesn’t happen for us sentient beings. They do not appear not merely labeled by mind, even when you go to the supermarket. Whatever you look at – all these forms, all these many thousands and millions of things: the sky, the road, the people – all appear to you according to the wrong views described by all those schools. Meditate on that. You’re illusioned by your ignorance. The magician is ignorance; you are the audience. All this is an illusion. I’m sitting here, you’re sitting there. We’re here having tea, but all of this is illusioned as real – real “I,” real restaurant, real tea, real snacks. All the rest is the same, appearing real. Then, if it’s done with bodhichitta, thinking, “I must achieve enlightenment to benefit sentient beings, to free them from the oceans of samsara and bring them to enlightenment,” it becomes the cause of enlightenment. From a talk given in Kuala Lumpur, Malaysia, in April2016. Transcribed by Ven. Thubten Munsel. Edited for inclusion on FPMT.org by Gordon McDougall. CORRECTION: This teaching was giving in Kuala Lumpur in April 2016, not in Penang in March 2016 as first published. It has been corrected in the text.